Wow, you guys… You know how I’ve started this trend over the last few months of not being able to limit my thoughts on each issue to just one post? That’s pretty much going to be the case here too. Because the last page is insane! And I can’t talk about it in this (mostly) no-spoiler review. And that’s not even the only thing I want to talk about. I will try to get my double review of Daredevil: Dark Nights #3 and #4 in there too (more than one of you have asked me about that), but for now, let’s look at Daredevil #31! First of all, let me just get this out of the way and give some major kudos to Chris Samnee and Javier Rodríguez for the artwork this issue. There is a lot going on in almost every panel. There are crowds with tons of people – from many angles and at various distances – there is stormy weather, there are giant ants (don’t ask…) and there are plenty of tiny little screens with even tinier people in them. Samnee took on the unenviable task of illustrating all of these miniscule details and knocked it out of the park. Then, Rodríguez made sure every one of those details got the right splash of perfect color. I’m going to take the liberty of of speaking for myself and many other readers and say: Your hard work is much appreciated! This is a beautiful issue. Much of this issue takes place in and around courtrooms. However, it doesn’t revolve around one of Matt’s cases, but instead ties directly to another case that shares more than a passing resemblance to a highly publicized real case that I suspect most readers will be well familiar with. This is an interesting choice on Waid’s part and is a good way of tying the Marvel Universe to things happening in the real world in a way that doesn’t risk dating the issue years from now. It also presents us with a very logical connection to the Sons of the Serpent subplot that began in Daredevil #28. 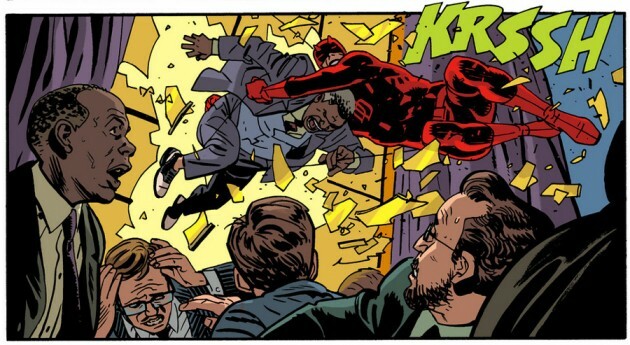 In stark contrast to the more grounded part of the story, we see Matt once again rely on his semi-regular “side-kick” Hank Pym to deal with the bigger-than-Daredevil-sized fall-out of the case mentioned above. Hank’s own power set and modus operandi help infuse this title with elements from the rest of the Marvel Universe. As zany as Hank’s ants might seem in the context of a street-level Daredevil story, I am really enjoying what his appearances contribute to this title. 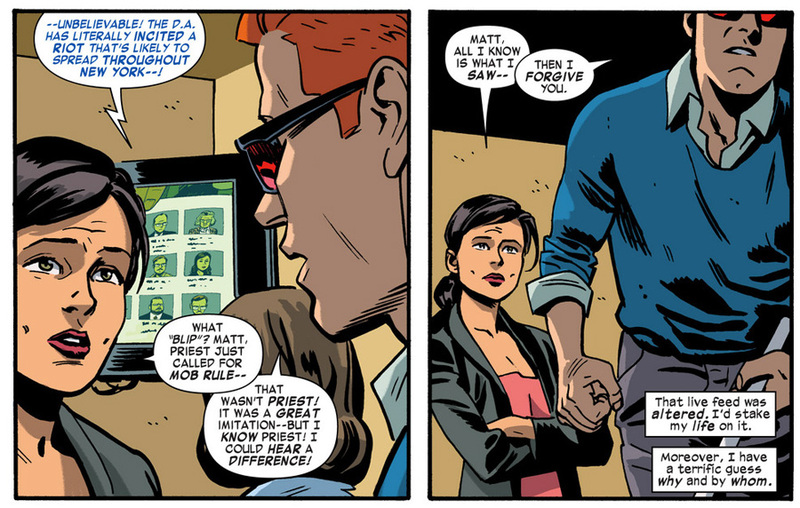 They always get a chuckle out of me and offer a much more plausible way to handle major threats than over-extending Matt Murdock’s own abilities. If you’re facing a Thor-level threat, step away and let Thor handle it! So to speak. So far, we’ve talked about something new and something wild, but in standard Waid fashion, we also get a connection to something old. When the main villain of this issue is introduced (while still hiding off-panel), Waid uses what is known about his old ways of meddling to make him a very logical choice for this issue. What is interesting, though, is how personally he appears to be targeting Daredevil. This team of creators have long impressed with their impeccable sense of pacing, and knack for advancing many different plot points every issue. Both of these abilities are on display here. This issue comes together as a complete whole in a way that is truly spectacular, and still leaves time and space to check in with Foggy – in a beautiful three-page opening sequence – and the rest of the office staff. It is also full of little moments that highlight things that are unique to Daredevil, such as his inability to be fooled be doctored images (an advantage), as well as his cluelessness when confronted with an iPad (a disadvantage). Daredevil #31 presents the readers with a full and complete experience that touches on so many different notes. I thoroughly enjoyed it. I’ve already talked about the incredible amount of work the art team must have put into this issue. 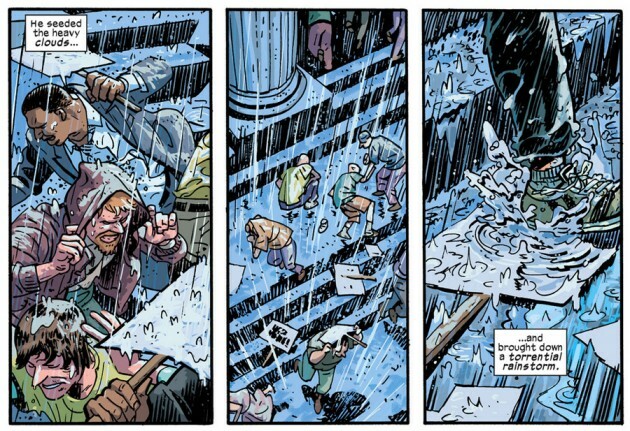 That’s always the case, clearly, but Daredevil #31 is truly mind-blowing in its rich details and flawless execution. People keep saying that they’ve run out of ways to complement the artwork in Daredevil, and that is perhaps the only downside to seeing work so consistently excellent. There is something to like about every single panel. Samnee infuses so much life into each of his characters, and Rodríguez’s colors add those perfect finishing touches like the perfect glow of a screen or the icy blue of a rainy street. I love you guys. No joke. Like I said, I have reason to return to what happens in this issue, particularly at the very end, but for now, suffice it to say that we’re facing a nearly intolerable wait until the next issue. Well played! Great review! I can’t wait until next month’s issue!!! How do you pronounce ‘Tomp’? Is the ‘p’ silent? Ha ha that is so cool, in a geeky way. Congrats Christine! Also an awesome issue. It just keeps getting better. Good time to be a DD fan! Congratulations! I hope you at least made scale for your speaking role. I wonder if the creators are fans of ‘80s television as well, because Alex P. Keaton (Michael J. Fox’s character from “Family Ties”) was on that jury with you. The billyclub-chicken wing with complementary head punch is easily my favorite martial arts move of the week. I also don’t think Sally Draper (from “Mad Men”, 13 in 1968) would be that old looking.